This 2 bedroom villa is located in Protaras and sleeps 5 people. It has WiFi, barbeque facilities and air conditioning. Protaras Dandelion Cottage is a two bedroom, semi-detached villa, built in the traditional Greek island style architecture and situated in a quiet sought after area of Ayios Elias Hill. The house was recently renovated in 2016 and decorated with taste to comfortably sleep 4 persons and features two spacious bedrooms, a family showeroom, guest toilet and an open plan kitchen and living area that open up into a tree-covered patio equipped with dining table and chairs that offers excellent relaxation atmosphere. Dandelion Cottage is fully air-conditioned, fully euipped and offers free Wi-Fi and satellite TV. Being well above sea level the climate is much better and more fresh even in the mid-summer heat the outside patio is ideal for relaxing while you enjoy a refreshing ouzo meze. 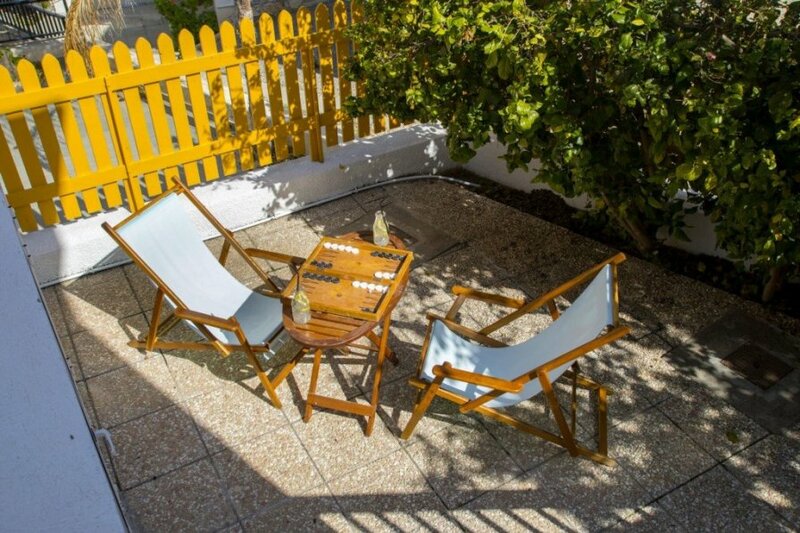 Dandelion Cottage is ideal for relaxation yet just a couple of minutes' drive to some of the best beaches in Cyprus and the Central Protaras Strip. Neighborhood Protaras Dandelion Cottage is a 2-bedroom semi-retouched house on Ayios Elias Hill with good views located in a quiet very much sought after area just 3 minutes' drive or bicycle ride to the centre of Protaras and the best beaches in the area. Protaras is ideal for kids of all ages Protaras is a more family oriented resort for children of all ages has numerous crystal clear water and white sand beaches, the most famous of which is Fig Tree Bay and Sunrise Beach. Ayia Napa, a land where the world’s colours meet and harmonize. Discover golden sandy beaches beside crystal clear turquoise waters. Enjoy all the latest sea sports, challenge your strength and endurance and possibly discover new realms of potential within. Indoor facilities • Air Conditioning • Blender • Cooker • Filter coffee maker • Free Wi-Fi Available • Freezer • Fridge • Hair dryer • Iron and Board • Kettle • Microwave • Satellite TV • Toaster • Washing machine • Wi-fi available • Widescreen TV Outdoor facilities • BBQ • Patio • Table and chairs Services • Arrival Clean • Departure Clean • Linen provided • Optional Extra Maid Service Available • Towels provided • Weekly Clean & Laundry • Welcome Pack Policies Check in: 16:00 / Check out: 11:00 Payment options Visa, Maestro, Mastercard, American Express, Discover, Paypal, Cash, Wire transfer 1. Listed Prices include 200KWh of electricity per week which is more than enough for normal use of the house. Additional electricity consumption is charged at Euro0.30/Kwh.